Aside from just how bloody brilliant E*POWAH is, one of the biggest surprises when I first got my EMTB was the cost of insuring it. Several quotes were within touching distance of an eye watering £200 once essential options like public liability and legal cover are ticked. I can insure a brand new £15,500 1.2 Ford Fiesta Zetec for that kind of money. I checked, and everyone’s favourite cinema loving meerkats confirmed that fully comp coverage on a middle of the range Ford, for me at least, costs around the same as insuring my Specialized Turbo Levo HT 2019, which as an entry level bike, set me back £2250. My fantasy Fiesta will be covered against theft as long as it’s locked, even when parked in the least salubrious part of town. Should some promising young footballer make off with it, the insurance company would likely pay out as expected. They’d have no choice as I would have been adhering to the policy T&Cs simply by locking the doors and not handing my keys to a track suited local joyrider. Monstrously expensive bike insurance though, isn’t worth a penny if you don’t adhere to some pretty strict requirements. First up you need to use a Sold Secure Gold lock at all times. 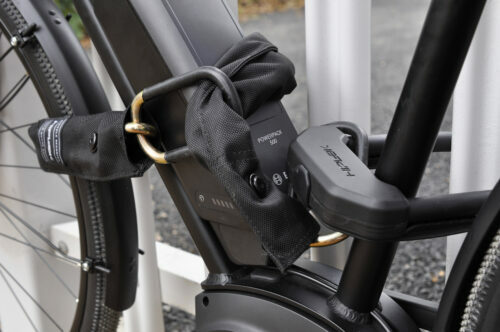 Then, to guarantee your bike is covered for theft from home, it has to be locked to an existing built in fixture or a purpose installed Sold Secure Gold anchor point. Some may have this already, but if you haven’t it’s just another expense. The investment in home security is worth it if the Crime Survey for England and Wales is to be believed though. 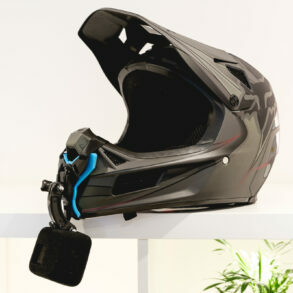 It states that “bicycle thefts were most likely to occur in a semi-private location nearby the victim’s home; this includes outside areas on the premises and garages around but not connected to the home”. So, get those outbuildings secure. Regardless of the hoops the insurance companies make you jump through, it makes good sense to select the right security equipment in the first place. Don’t underestimate the likeable scallywag with an X-Factor worthy backstory that no doubt already has an eye on your bike. Short of going all Home Alone in your garage or shed, which won’t sit well with your family, or indeed local plod when they attend the scene of the crime six weeks later, the humble padlock is going to be your first line of defence. While 660,000 bikes were pinched in the UK in 1995 recent figures are much lower, with ‘just’ 290,000 bike thefts in 2017. Basically you have already had a bike nicked or you’re likely to at some point. Fortunately bike lock manufacturers continue to introduce new designs and technologies in an attempt to deprive you of your ride. 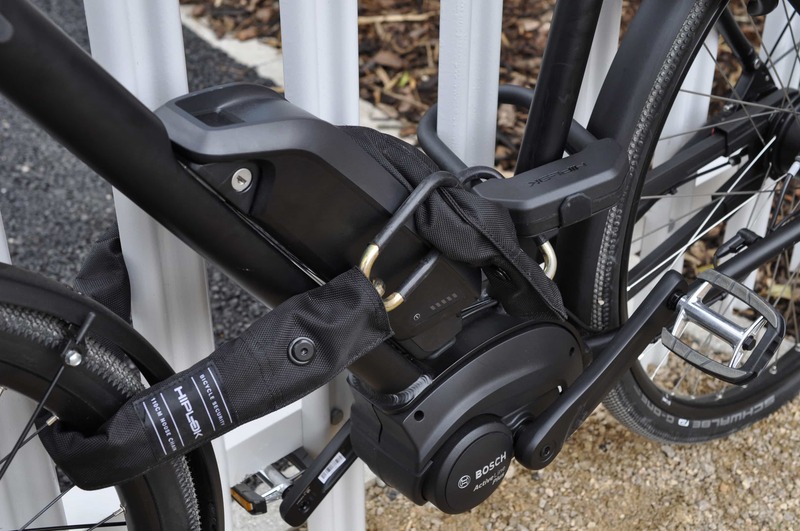 One of the latest developments is the Hiplok E-DX, which is rather interestingly billed as an E-bike + Cargo Bike specific locking system. Hiplok says that the E-DX is “designed for the ultimate in versatility,” and I’d have to agree that the combination of a Hiplok DX shackle and beefy, 110cm hardened steel noose chain gives you plenty of options, especially for securing several bikes at a time. The package is completed with the inclusion of a Z Lok Security tie, used for securing loose items or accessories on your bike. My first impression of the E-DX was simply that it’s a beast. The ridiculous 3.5 kg weight just screams “I’m your daddy”. But it also negates ‘CLIP + RIDE’ Hiplok’s core USP where shackles can be carried on your hip (geddit?) and the chains around your waist. The shackle is comfortable enough to carry if you are out and about, but I wouldn’t take the E-DX chain out. Even Hiplok is aware that it’s a bit too much, stating “leave the E-DX’s noose chain at home and use the DX’s CLIP + RIDE system to easily clip your DX to belts, waistbands, bags or pocket”. Materials and build quality are frankly second to none, which is to be expected considering the hefty retail price of £119.99. For your money, you get a stunningly well-engineered piece of kit. The locking action is incredibly smooth, the finish on mine is flawless and the build quality instills confidence. 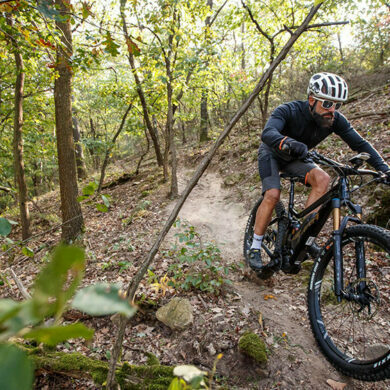 Despite its weight, using it is easy, and you don’t have to worry about bashing your frame as the washable nylon chain cover mitigates most metal on metal action. But how secure is the E-DX? Unfortunately, we can’t answer that question. At EMTB Forums, we neither have the budget or criminal contacts to recruit an ex-con turned security consultant to try and defeat the Hiplok E-DX by any means necessary. We can’t tell you how long it would take to cut through it in an independent test, but its Sold Secure Gold rating used to be reserved for locks that lasted “five minutes with a sophisticated array of tools”. The Sold Secure organisation now classifies Gold rated locks with a little less detail; they “offer the highest level of security”. The Hiplok E-DX is also rated by Danish firm Varefakta and is basically, about as tough as they come. But why choose it over several other meaty and similarly wallet-busting Gold rated locks on the market? Simply put, having the Hiplok E-DX in the garage has made me feel invincible. I really hope that statement doesn’t come back to bite me, but it’s such a beast of a lock that you can’t help but pity the poor sod who thinks he can have a go at it. 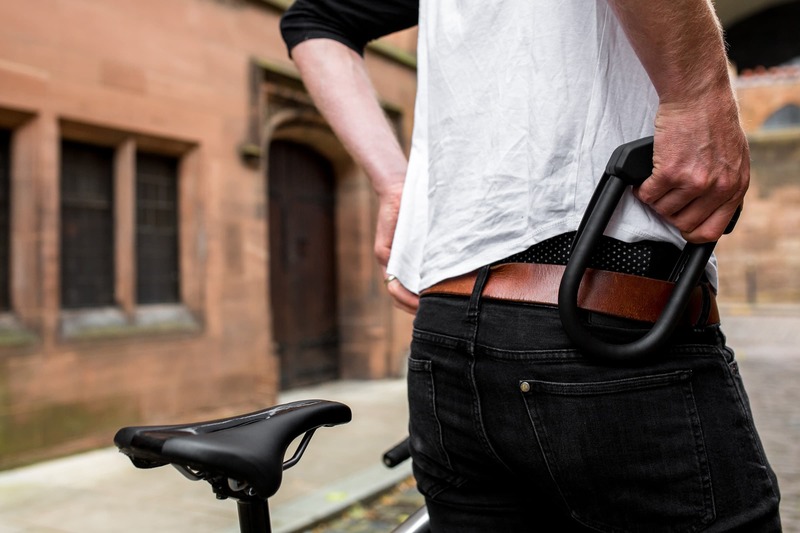 At least for EMTB owners, Hiplok’s portability USP is not so relevant as the chain will most likely never go out with you, but having the option to slip the shackle on your waist or throw it in a day bag ensures you can lock your bike up pretty much anywhere, and be insured. Used for bolstering your defences on the home front, the E-DX is a flexible and secure system that gives you plenty of confidence. The bonus of having a very portable shackle provides dual use, making it a one lock does all proposition. However, I’m not convinced that it does anything specific for EMTBs apart from offering top-tier security for expensive, desirable products which are unfortunately now firmly in the cross-hairs of ne’er-do-wells everywhere. While we didn’t attempt to pick the lock or cut through the chain or shackle, it’s clear that the E-DX will give even the most determined rogue a hard time. With high quality materials and manufacturing, versatility and resilience, the Hiplok E-DX should be on your shortlist when looking to secure your pride and joy. Oh, and it comes with three keys. I would guess that most bike thefts are opportunistic and of unlocked bikes. I carry a 5mm braided cable and a padlock. It might weigh 200 grams. More than enough if I stop for a coffee. I figure that a thief will just steal the unlocked bike next to mine. I have the Hiplok DXC…which is great …not so heavy, but this is next level security..I assume it can be worn around ya hips…not a ‘bike-fashion’ statement but a good way to distribute all that weight … off for a ride! MERIDA EX – Is 2019 the breakthrough year for ebike racing?